Pygar Nasir by McHotcakes did pass united fanscape evaluation and move on in the process. Pavin Nahz by Arch-vile did not pass united fanscape evaluation and is removed from the process. The callouts in Cover Shot Special Attack are artificial; also this is not a design that the original designers would have released. I am nominating my Prince Al'kahora design to the SoV for consideration. Balance- Al'kahora brings a nice punch to the table, offering melee firepower previously unavailable in the 80-point price range. But his relative fragility for a melee hero--with only 5 life, 3 defense, and no defensive special ability--balance him out nicely. Playability- Al'kahora builds on pre-existing powers in clean and simple ways. The mini looks good, is appropriately sized, and stands out on a Heroscape board. Creativity- Both of Al'kahora's powers are elegantly exclusive of the other, a design space that has not often been explored in Heroscape designs. As I mentioned before, Al'kahora's price-point allows him to fill the vacuum of 80-point budget melee hitters. Theme- A noble and skilled warrior can usually find himself at home in Valhalla. Accessibility- The figure used is a Heroclix figures called Ian Nottingham. On abPrices alone I found 81, which is enough for a Unique Hero. The Prince/Knight combo still feels wrong to me. Prince Al'kahora works well, and Al'kahora the Knight is cool too, but the Prince/Knight Al'kahora feels like forced synergy and theme. I'm also interested- is he still from Arctorus or did you change him to Earth? What is the mini used? It's something from HeroClix Indy, right? I don't mind the Prince/Knight combo. Strike of the Puma looks pretty powerful, but it's probably OK. On the whole, I like it. Balance- Armoc Warlord is another Ullar Warlord to come to Vahalla, that boosts the defense of the Armocs. He odd point total allows her to fit better in Armoc builds and harder in Roman builds. She also provides a medium SA to both fronts. 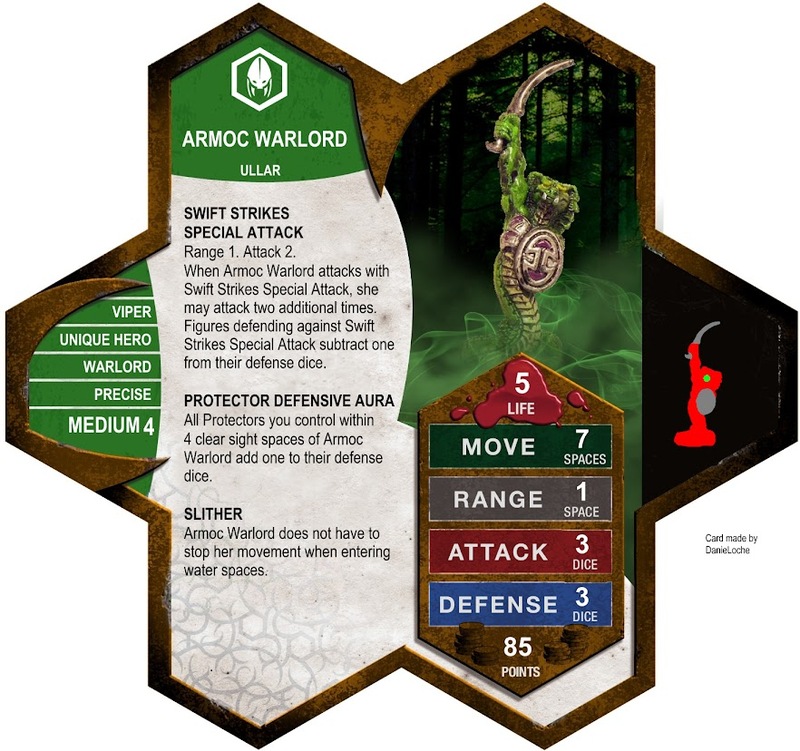 Playability- Armoc Warlord's powers are simple yet effective. Her SA can be a hit or miss, but still provides more attack options. Do you rush her out front her have her support the Armocs? She's smaller than the other Vipers, but the theme explains how that is okay. Creativity- Armoc provides a SA to the Vipers and Romans, but her odd point total and special power makes her more worth her points in a Viper build. Theme-"Wielding the sword and shield of Raptorian Supreme, Daenoterrix, the young Viper earned her rank after leading the Raptorian's assassination prior to the war." She appears different than the other Vipers since she is a young female Viper, and her SA and Precise Personality reflect her Assassin past. Armoc Warlord has earned the Armoc Viper's respect and fight more cautiously around her. Accessibility- Numbers as a standalone Yuan-Ti Swiftscale are low (abprices is out of date), but the DnD Dungeons of Dread Starter Set of 5 figures is more common and goes for the around the same buying rate as a HS pack use to go: around $15-$20. It also appears that some HSers already have this set (how many I'm not sure). I placed 99 Starters in the cart and went to checkout at http://www.fairyglen.com/woc21551.html#.Unj8jVRDt3- and everything seemed fine. Last edited by MegaSilver; November 5th, 2013 at 09:14 AM. I still like the idea of him being from Arctorus. Regarding the Armoc Warlord, can you give more precise numbers on the availability? Maybe look at some online stores rather than abPrices? I would be willing to give her a tentative if the numbers for that starter set really are high enough, but that will be a big factor in the Inner Sanctum joint vote, as we may not want to commit to using another entire miniature set. I was allowed to place 99 Starter Sets in the cart and procede to checkout. Don't know if that's how they got their site set up to check on your purchase at a later time or not. They also allowed me to place a bunch in my cart. Amazon, as the link I gave, has 12-14 Starter Sets from the one seller. It appears to have the same situation as the Deathwings; there's not really a place to get a bunch from one store, but you can find a scattered across the internet. But you only need one figure since they she is a unique hero. As to Yuan-Ti Swiftscale as a standalone figure, Troll and Toad had 4 last I checked. MiniatureMarket has 1. lol. Ebay has several Swiftscale singles for sale. A mostly stand-alone fantasy(esque) hero doesn't push any buttons for me, neither does another 80pt hero, but the design is solid and he looks to provide some unique play. And a Prince being a Knight doesn't bother me at all. I'll need to get the mini in-hand to see how I feel about it compared with the other Vipers, but the backstory goes a long way to help that, as well as help justify some parts of the design. Adding defense to Vipers seems like the wrong direction to go thematically, but I could be convinced. She is slightly taller than Kyntela Gwyn and has a similar posture. I'm not sure how anyone could reasonably complain about the Armoc Warlord not fitting in with the other Vipers after the Azurite Warlord.